When deposited, sand and mud have lots of pore space filled with water and have relatively low density. However, as they get buried by more sediment, much pore space is lost, both through compaction and cementation. Sediments turn into sedimentary rocks, become harder, and their density increases. In contrast, salt doesn't have much pore space to begin with; its density will stay the same, regardless of depth of burial. As both salt and sediment are buried to greater depths, an unstable condition develops: lighter salt lying under denser material. 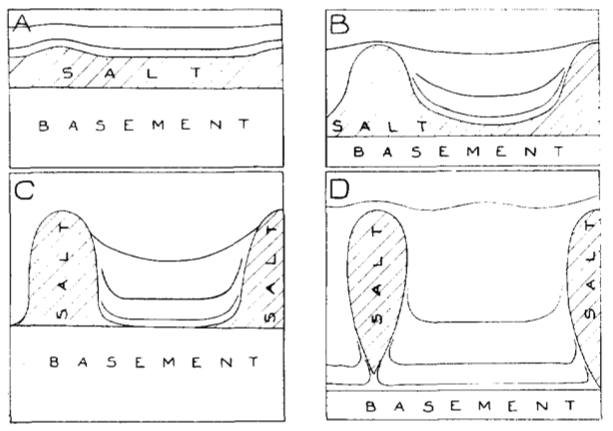 In addition, the location of the salt layer in the sediment column is not entirely random: it is in the nature of sedimentary basins to initially place salt at the bottom of the sediment pile. Extensive salt layers usually form early in a basin's lifetime, when seawaters invade for the first time shallow depressions on a continent that is about to split into two along a rift zone. The Dead Sea is an obvious example that comes to mind. Layering salt and sediment in this unstable order is a recipe for a spectacular geological show. As salt is trying to find its way to the surface, it forms drop-shaped blobs called diapirs; but also ridges, walls, and salt sheets. Several sheets can connect laterally into a huge salt canopy, a new salt layer that is entirely out-of-place or allochtonous. Salt can also act as a lubricating layer at the base of a thick sequence of sedimentary rocks. But I am rushing ahead a little bit; salt tectonics is such a new - but rapidly growing - science that salt canopies, despite their widespread presence in the subsurface Gulf of Mexico, were not recognized and described until the 1980s. Before the beginning of the twentieth century, even with the role that salt played in human history, little was known about how salt domes formed. This was an age of rampant speculation; surface data was scarce because salt does not last very long after exposed as it quickly gets dissolved and washed away by precipitation. Many geologists thought that formation of salt domes didn't require any significant salt deformation or displacement. But things have changed dramatically in 1901, with the discovery of the Spindletop oil field on top of a salt dome in southeastern Texas. The recognition that oil is often found on top of and around salt domes created a much stronger interest in understanding how exactly salt formations are put in place. European geologists thought that the main driving force was compression, the force that causes folding and thrusting and builds mountains. In Romania, where the Eastern Carpathians take a sharp turn toward the southwest, salt was found in the cores of oil-bearing anticlines. The contacts with the surrounding rocks were clearly discordant. These are the structures that prompted Ludovic Mrazec, professor of geology at University of Bucharest, to coin the term "diapir" in 1907. Mrazec's explanation of how salt diapirs form. From Barton (1925). Salt in Germany and Poland also seemed to occur invariably in a compressional setting, in the cores of folds, next to folds that had no salt associated. It seemed obvious that salt was 'pushed up' by tectonic forces, and it appeared unlikely that the rise of salt itself was causing the folding. But the discovery of a multitude of salt diapirs in the Gulf of Mexico made it clear that they can occur far away from any mountains and compressive tectonic forces. The much simpler setting and relative lack of deformation in the Gulf proved informative. "The Roumanian salt-dome geologist possibly may have more to learn from the American salt domes than the American salt-dome geologist has to learn from the Roumanian domes. The occurrence of the American domes in a region of tectonic quiescence suggests that tectonic thrust cannot have the importance postulated by Mrazec" - wrote Donald Barton in 1925. The solution to this problem came in 1933, from the same Donald Barton who was discussing the differences between European and American salt domes in 1925. He suggested that diapirs can form without much piercement of the sediment above. Instead, once a small dome is initiated, it simply can stay in place, always at or close to the surface, while sediment is deposited around it and the source salt layer subsides: "it is the sediments which move, and not the salt core. The energy requirement (...) is very much less than if there were actual upward movement of the salt." The evolution of salt diapirs through 'downbuilding'. 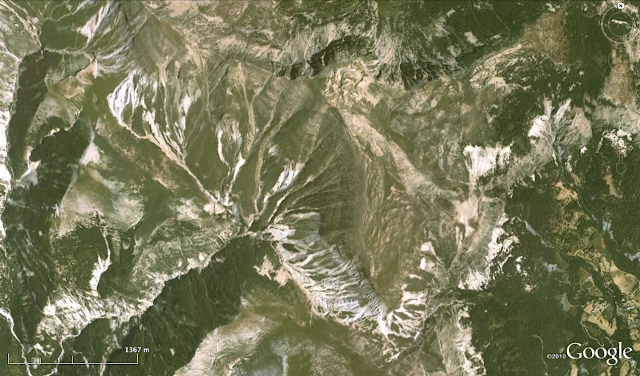 Salt domes are always close to the surface and diapirism goes hand-in-hand with sedimentation. From Barton (1933). This was a key insight: it got rid of the "room problem", the need for moving huge volumes of hard rock out of the way of the rising salt. It also highlighted that salt movement can happen at the same time with sedimentation, a fact that became abundantly obvious later as high-quality seismic data became available. But the concept of 'downbuilding' was ignored for the next fifty years. Animation showing how downbuilding works. Blue represents salt, yellow is sediment. To mimic mass balance for salt (-- what is lost from the source layer must go into the salt dome), the blue area is kept constant through the animation. Right-click image for animation controls. The main reason for conveniently forgetting Barton's idea was that density inversion between two fluids could be nicely studied in the lab and described with elegant equations. 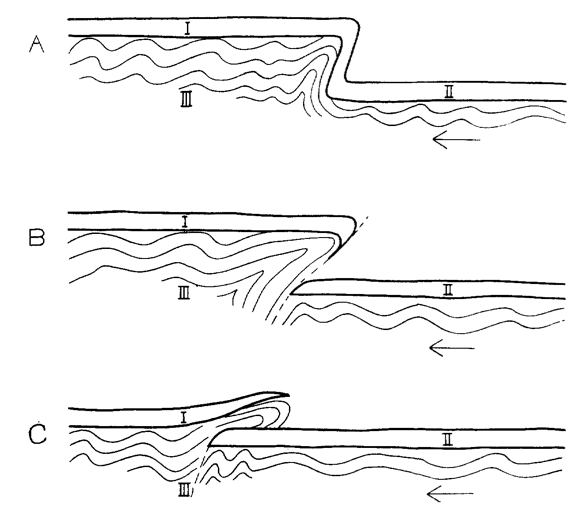 In one of the papers that kicked off this fascination with Rayleigh-Taylor instabilities, Nettleton (1934) used corn syrup and less dense crude oil to visualize diapir-like blobs of fluid in a transparent cylinder and to show that gravity alone, without any help from contractional forces, was enough to generate structures similar to salt domes. By the late 1980s it has become quite obvious that kilometer-thick piles of sedimentary rock cannot be treated as fluids and salt-sediment interaction is more similar to placing and deforming slabs of brittle material on top of a viscous fluid. 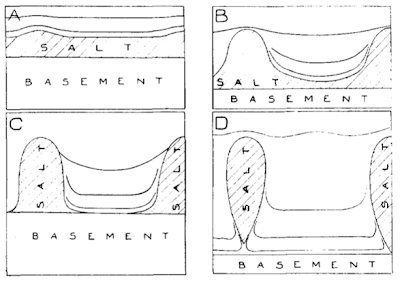 Seismic from salt-bearing sedimentary basins suggested that the history of salt movement and sedimentation were highly interconnected and Barton's downbuilding concept was strongly relevant.